Llewelyn Moss, Vietnam veteran turned welder living with his young wife in a trailer park, discovers a grizzly scene whilst out hunting antelope near the Rio Grande – a drugs transaction gone badly wrong, all the participants dead bar one who is badly injured. Ignoring the trailer load of heroin, Moss finds he can’t pass over the two million dollars in cash. Taking it, he knows, will lead to a whole heap of trouble, leaving it defies logic. Unable to live with his conscience of abandoning a dying man in the desert, Moss makes the mistake of heading back to the scene to help, and so begins a terrifying chase, as both the Mexican drug runners and the American buyers want the money. But this is no simple chase, as the psychopathic Chigurh tracks Moss across Texas, leaving a trail of destruction in his wake. Sheriff Bell has a lifetime of experience, but in following Chigurh’s trail he comes to realise that America has changed and it’s no country for old men, with different values and comprehension of the world, to be practising law enforcement. No Country for Old Men is a powerful tale of greed and corruption, a lament to the American dream polluted by drugs and violence. McCarthy writes in a simple, no frills style that is deceptively rich and layered. 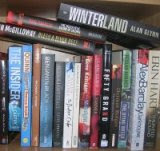 It is literary in its construction, but doesn’t resort to long words or complex styling. Its power is in its voice. It is storytelling as heard on the back porch or in the local bar by a seasoned raconteur using everyday language. 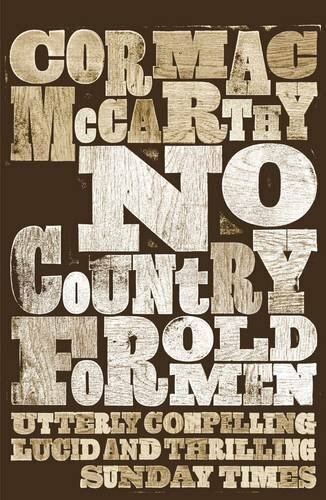 McCarthy captures the lyricism and cadence of speech and thought, no more so than when he swaps into the narrator’s voice of the increasingly disillusioned Sheriff Bell. The characterisation is excellent and the plotting is captivating. My only gripe is that the story becomes a little derailed towards the end, with one discordant jump in the story that lacked explanation, and a general trailing off in the narrative. Overall, a compelling read that wasn’t quite sustained throughout. Rob - Thanks for this review. I admit I hadn't read this one, although I suspected it was better than the movie version. I'll have to keep my eye out for it. The movie scared me to death. What a villain.